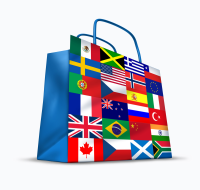 We ship to over 80 countries. We have many standard shipping options to choose from (which vary depending on your shipping address). We ship via US Mail, FedEx (including SAMEDAY FedEx), UPS, DHL, Greyhound, Delta Dash and you may contact us for commercial freight or courier. We try to ship all orders the day that they are placed or the next business day. Depending on your location and the items in your order the fees for shipping will change. To check our fees, please click the checkout button after adding the items you want to your shopping cart. You do not have to provide any personal information to get the shipping charges, on the checkout page select your country and state/province and let our cart refresh with the shipping charges. If you would like to use a method not offered to you on our checkout page, please contact us.